A mother’s 6-month-old son eats rice cereal for the first time. Shortly after, he lies limp in her arms as his skin turns blue. Another mom’s 3-month-old daughter, who was thriving on an exclusively breast milk diet, begins supplemental formula for the first time. Hours of vomiting and diarrhea follow as well as signs of severe dehydration. These infants were tested for food allergies, but the results came back negative. It turns out that both children had a rare food allergy called food protein–induced enterocolitis syndrome (FPIES), for which there’s no laboratory test. The absence of diagnostic tests for FPIES and related conditions, combined with a general dearth of knowledge in the nonspecialist community leads to underdiagnosis, unnecessary testing, prolonged suffering of infants and young children, and frustrated, frightened families. The gold standard for diagnosing non–IgE-mediated food allergies (NFAs) is resolution of symptoms when the offending food is removed from the diet. Typically, all GI symptoms resolve three to four weeks after implementing the elimination diet. The diagnosis is confirmed if symptoms return when the suspected allergen is reintroduced.2 Identifying allergens can be difficult, since reactions can be delayed for hours after ingestion. Dairy and soy are the most common triggers of FPIES and other NFAs. Since standard formulas are dairy or soy based, formula-fed babies will become ill from the start. Breast-fed infants aren’t entirely protected from FPIES, as dairy and soy proteins in the mother’s diet pass into her breast milk. 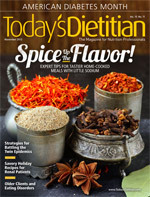 Dietitians often are on the front lines of diagnosing NFAs. “As a pediatric nutritionist, I’ve gotten referrals for feeding difficulty or GI disorders that turn out to be FPIES. Sometimes I see children referred by an allergist because they tested positive for one food allergy, but find out they have non–IgE-mediated reactions to other foods,” says Koch, who works as a team with a pediatric gastroenterologist and a pediatric allergist to diagnose and treat FPIES patients. The FPIES Foundation was launched to address this lack of awareness. “Our mission is to offer tools for education, support, and advocacy to empower families and the medical community to overcome the challenges of FPIES,” Meyer says. Non–IgE-mediated GI food allergies such as FPIES once were considered benign conditions easily corrected by avoiding the offending food. But families who have struggled to find help for violently ill infants and children would certainly disagree. The more that’s learned about NFA reactions, the less straightforward they appear to be. New findings are beginning to show a complex interplay of environmental issues such as gut flora and dietary factors affecting intestinal mucosal homeostasis.5 Educated nutrition professionals are an integral part of the health care team needed to accurately diagnose and treat these disorders. The nutritionist worked extensively with the family to introduce new foods in a safe, controlled way and to construct family-friendly meal plans that avoided even trace amounts of rice products. The child outgrew his allergy by the age of 3. The 3-month-old’s pediatrician suspected a reaction to the dairy-based formula and suggested soy-based instead. When the child began vomiting several hours after trying the soy formula, her mother contacted a lactation consultant and negotiated with her employer to pump breast milk several times per day while at work. With the advice and support of a dietitian, the mother removed dairy and soy from her own diet to avoid passing any proteins to her daughter through her breast milk. When the mother introduced her daughter to solid foods, she gave her no dairy or soy, and the child had no adverse reactions to other foods. A food challenge at the age of 18 months showed that the daughter had outgrown her dairy and soy protein allergy. Both children are healthy and doing well. 1. Sampson H. Non-IgE mediated food allergy: new diagnostic challenges. J Pediatr Gastroenterol Nutr. 2004;39:S549-S550. 2. Sampson HA, Sicherer SH, Birnbaum AH. AGA technical review on the evaluation of food allergy in gastrointestinal disorders. American Gastrological Association. Gastroenterology. 2001;120(4):1026-1040. 3. Woznicki K. Food allergies: 5 myths debunked. WebMD website. http://www.webmd.com/allergies/features/food-allergy-myths. Updated May 21, 2010. Accessed August 29, 2013. 4. Allergy testing: tips to remember. American Academy of Allergy, Asthma and Immunology website. http://www.aaaai.org/conditions-and-treatments/library/at-a-glance/allergy-testing.aspx. Updated 2013. Accessed September 3, 2013. 5. Jyonouchi H. Non-IgE mediated food allergy — update of recent progress in mucosal immunity. Inflamm Allergy Drug Targets. 2012;11(5):382-396.